Batat ‘phovu’ (as its said in Konkani) is one of my favorite breakfast dishes. “Batata” is potato and “phovu” or “poha” is beaten or parched rice. 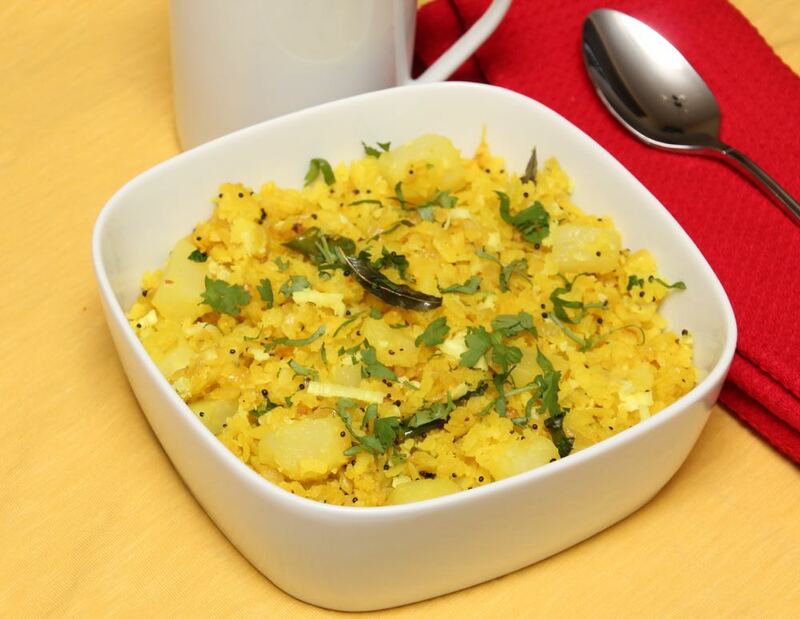 This dish is made with potatoes, onions and poha, easy to make and it tastes divine! Eat it as is or serve it with sev or chuda and a piping mug of filter ‘kaapi’ and you are good to go! Though its my favorite dish, I refused to make this for the longest time. The few times I tried making it, the poha turned out to be a soft mushy mess. I thought I was doing something wrong, even though I was following my Mom’s recipe to a “T”. It used to be very frustrating and disappointing. While I was on one my rants about the poha failure, my sister explained to me about the difference in the quality of the poha in the brands that we use. Poha or beaten rice or parched rice comes in two forms, the thick kind and the thin one. We are using the thick poha for this dish. There are different brands of thick poha available in the market these days and the quality of poha can vary from brand to brand. Poha can be very finicky as well. Some poha requires soaking them for at least 3-5 minutes to get that soft texture whereas others do not require any soaking whatsoever. I am using the non-soaking kind here. The poha that Mom uses needs soaking whereas the ones that we (my sister and I) use, do not need soaking. Of the brands that are available to us here in the US, I use the Lakshmi brand and my sister uses the Swad brand and both are quick cooking pohas. The recipe that my Mom had given me asked for the poha to be soaked after rinsing, I did just that. My batata poha was a flop. Then she asked me to leave the poha in the colander and just let the water drain away, I did that and my batate poha was still a flop with the poha flakes being clumpy and mushy. After getting the ‘quick rinse and squeeze out water’ tip from my sister, now I can safely say that my batate phovu comes out very soft and the flakes are discrete and not clumped together like before. To cut a long story short, learn your poha first! Wash, peel and cut the potato into cubes. Boil them in salted water till soft, it should still have a bite to it. Do not overcook the potato cubes. Drain the water and immediately put the potato cubes in cold water as it stops the cooking process. Set aside. Heat oil in a wok. Season with mustard seeds. When seeds splutter, add the curry leaves and green chillies. Saute for about 30 seconds or so. Put in the chopped onions and fry till onions are soft. Put in the turmeric powder and saute for a minute or two. Add the cooked potato cubes and mix well. Also add salt to taste. Rinse the thick poha under running water in a sieve. Do not wash it so much that it fragments the flakes. Squeeze out water from the poha and add it to the wok immediately. Be very gentle when handling the poha, the flakes shouldn't break. Add sugar, then gently stir the poha with the rest of the mixture. On low flame, cover and cook for about five minutes, stirring the poha every now and then. 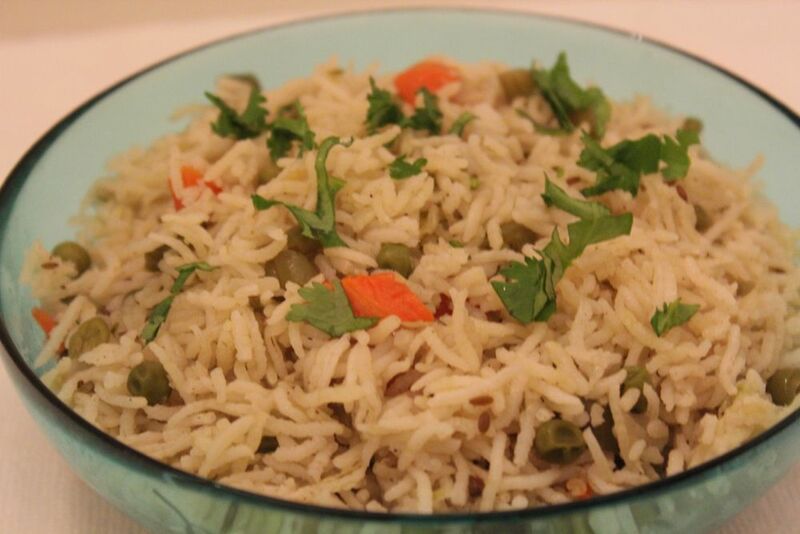 Garnish with grated coconut and finely chopped cilantro. Also lime juice can be added at this point if using. 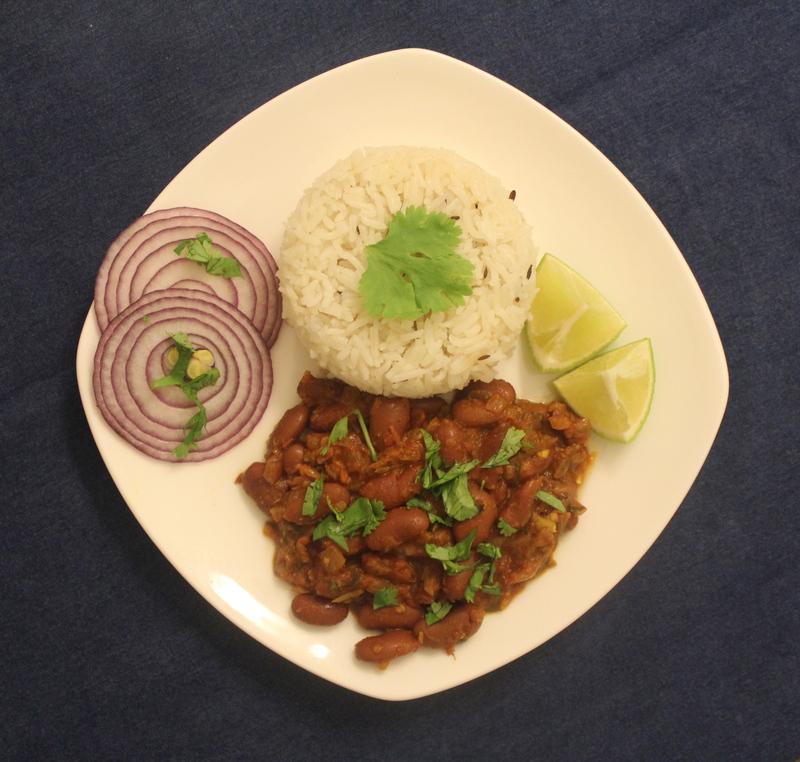 Serve hot with sev or any chuda/chivda/mixture of your choice or you can eat it as is. I like to pre-boil the potatoes. You can also cook them along with the onions. Add the cubed potatoes after adding the turmeric powder to the onions. Cover and cook till potatoes are soft. Proceed with the rest of the recipe. Mom adds grated coconut as garnish, could be the Konkani influence, you can skip this if you are not a fan of coconut. Rajesh’s mom grew up in Bombay and it could be the Bombay influence where she would add lime juice just before serving. You can add lime juice to the whole dish or you can serve wedges of lime/lemon at the table. This step is optional too. Interestingly, the Portugese word for potato is “Batata” and so is it in Konkani and Marathi. These were the communities that were in direct contact with the Portugese and the potato brought into India by the Portugese. Similarly pineapple is “Ananas” in Portugese (and many other European languages) and “Avnas” in Konkani and “Ananas” in Hindi. 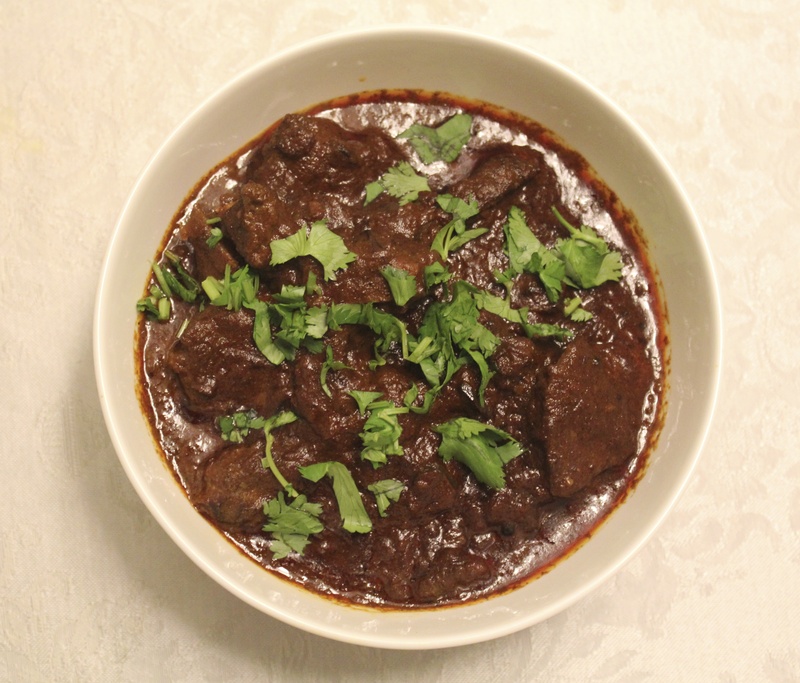 Copyright 2016 - Currylore.com . All Rights Reserved.